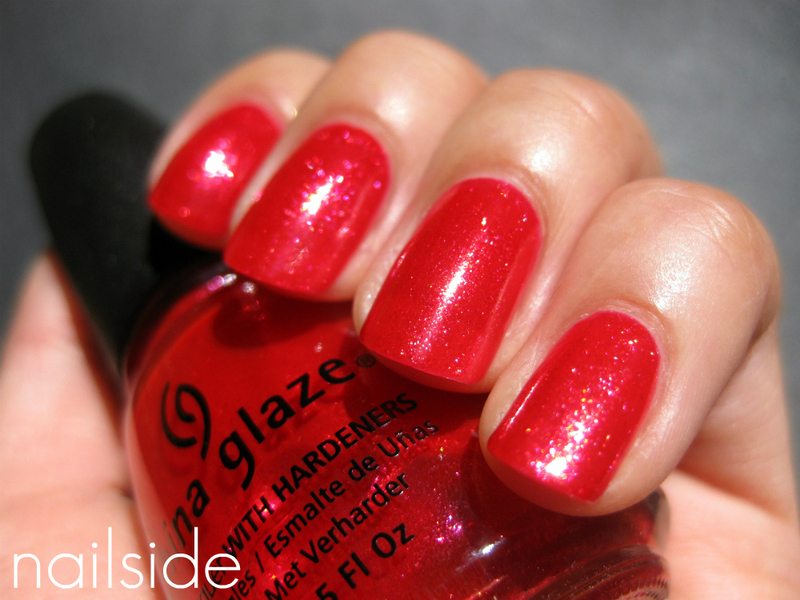 Nailside: China Glaze - Raspberry Festival? Hi everyone! 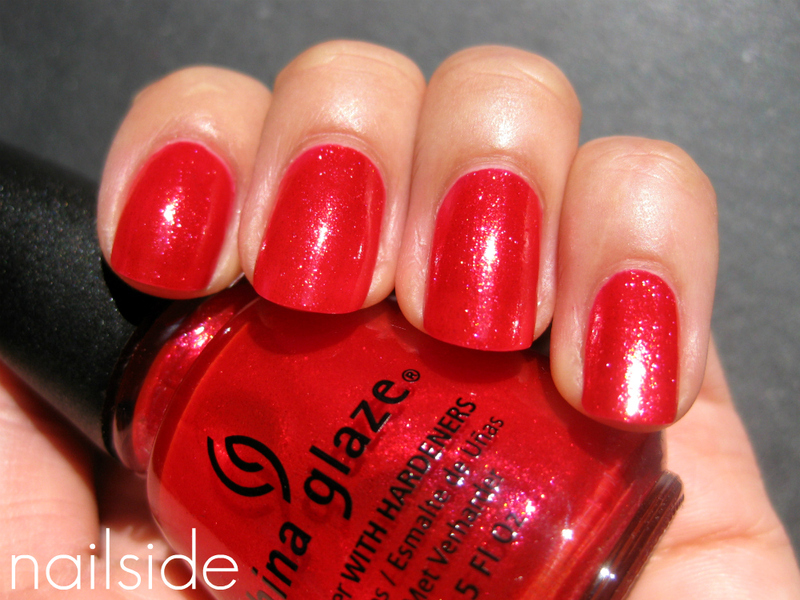 Today I have a gorgeous red polish to show you guys, China Glaze kindly send me this bottle for review. 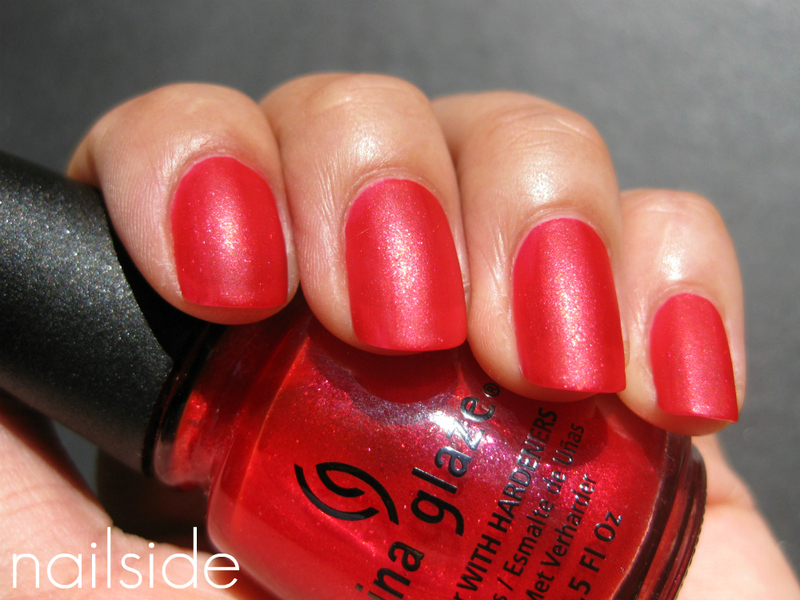 This pretty is a juicy, cherry red jelly with glass fleck shimmer. Red jellies hardly fail to look magnificent, but it's the glass fleck shimmer which makes this polish even more juicy and so sparkly! I took these pictures in a late afternoon sun in my front yard, (passers-by must think I've lost it), the sun brought out the color and sparklyness quite accurately, though of course nothing beats the way it looks in real life. Glass flecked polishes is what China Glaze is famous for and now I know why. Though the formula could have been thinner to my taste, the application was surprisingly nice, the polish spreaded evenly and smooth. In the pictures I'm wearing two (not thinned) coats, no topcoat, but you can still see how even and shiny the surface is. So yes, I love this polish. Its bright color and sparklyness are so fun and flirty that I could wear this all summer, glass flecks rule :) Can you believe that it took me 37 China Glaze polishes to get to my first of their glass flecks?! The only little downside of this polish was the drying time, which was a bit longer than I like it to be, but thankfully quick-drying topcoat was invented, amen. So now I've come to the point where I'm going to need your opinion, because this polish arrived at my home without label on the bottom, this beauty is nameless! So after a LOT of research, my guess is that this polish is called Raspberry Festival, from the 2009 Summerdays collection. Cherry Pie from the same collection, seems like a nice second guess, but since many wrote Cherry Pie is orange-toned, I knew that couldn't be it, my bottle doesn't look orange whatsoever. So until anyone disagrees, this polish is named Raspberry Festival. Wauw met mat erover heen is ie echt super gaaf! It looks just lik RF! It resembles a lot comparing my pictures with yours. When removing the polish it turns pink on the tissue, right? It looks so god, I love the shimmer. It looks so beautiful mattified! How do you get company's to send you items for review, that would be awesome! I looked at several swatches online, and I think you're spot on about it being Raspberry Festival. ChG DOES make amazing polish. And I agree that it looks simply brilliant with the matte top coat. That polish looks awesome matte! Thank you girls for your thoughts! @ManysSecrets: Yay, great to have second opinions that agree haha. It really is an amazing polish. Also thanks so much for the award!